It also takes all the sewage from the Netcare Christiaan Barnard Memorial Hospital, containing infectious viruses and bacteria. The Hout Bay outfall is 2.1km out to sea, but spews out 5.7 million litres per day closer to Dungeons, the world renowned big wave break. 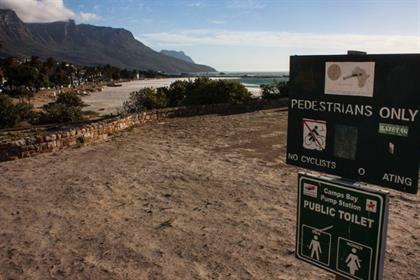 Also, the Camps Bay and Hout Bay outfalls pump sewage into the Marine Protected Area (MPA) which stretches from Mouille Point, around the peninsula to Muizenberg. This is prohibited by the Department of Environmental Affairs (DEA) unless permission is granted by the minister. But permission has not yet been granted because the City has been waiting for the finalisation of its Coastal Waters Discharge Permit, which came up for renewal in 2016. The wastewater treatment plant at Camps Bay pumps more than two million litres of raw sewage out to sea every day. Concern over the marine outfalls was raised at least five years ago when Edda Weimann took independent samples at Clifton beach in 2013. She found that five out of six samples taken between February and March failed the water quality standards for the beach's blue flag status. Although the sewage outlet points are 28m and 23m below the surface for Mouille Point and Camps Bay respectively, there was further controversy three years ago when photographer Jean Tresfon released aerial footage on social media of the sewage plumes apparently reaching the surface, including what appeared to drift into Camps Bay. Many articles have been written about it, including a well-written summary by Marina Keenan in The Big Issue. Despite concerns expressed publicly and in scientific papers by professional experts on the health risks of exposure to microbes, and more seriously, persistent organic pollutants such as contained in prescription drugs and household detergents (including natural and synthetic hormones) — the testing for which is not required by national legislation — the City maintains that the sewage pumped out through marine outfalls do not pose a risk to human health or the marine environment. On the one hand, it's not alone: many large cities dispose of sewage in the same way, but on the other hand, the City is failing to publish the results to prove there is no health risk. The City tests the water at beaches every two weeks to monitor levels of E.coli and Enterococcus bacteria. These organisms indicate how many other microbes there are. But despite historic data revealing periodic incidents of high E.coli contamination at the shore, the City has failed to make these results public in recent years. Up until five years ago, the City published an Inland and Coastal Water Quality report at sub-council meetings every six months, which contained the test results for the previous six-month period. The City's reasons for discontinuing the publication of these results is unclear, with different answers being provided. In January 2018, the City said the report's format was being reworked to align with new water quality guidelines, part of which required beaches to be graded in terms of water quality. A report on this was supposed to be presented to sub-councils before the end of 2018. It did not happen. Then last month, Mayco Member for Water and Waste Services Xanthea Limberg said the reporting was deferred because of a restructuring process in the City which began in 2017. Limberg said water quality reports were presented at catchment management fora meetings and to Protected Area Advisory Committees (PAACs).